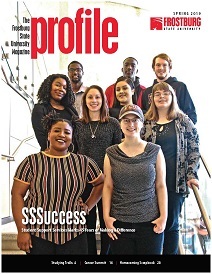 Profile is the Frostburg State University magazine. It is published for alumni, parents, friends, faculty and staff of Frostburg State University. Editorial offices are located in 228 Hitchins, FSU, 101 Braddock Road, Frostburg, MD 21532-2303. You can make a selection below to download a copy of the magazine in Adobe Portable Document (.PDF) format. You need to have Adobe Acrobat Reader to view the PDF file.